FlowStone is a product by a company DSP Robotics and is a graphical programming language similar to LabVIEW, but quite simple to use. Flowstone has ready-made modules for the U3, and many other devices such as Phidgets, credit card scanners, cameras, and Console controllers. Flowstone entry-level version/free trial can be found on their downloads page. Refer to Flowstone's support page for support and documentation. FlowStone is an ideal software package for beginners, and the entry-level version can be downloaded for free from their website. 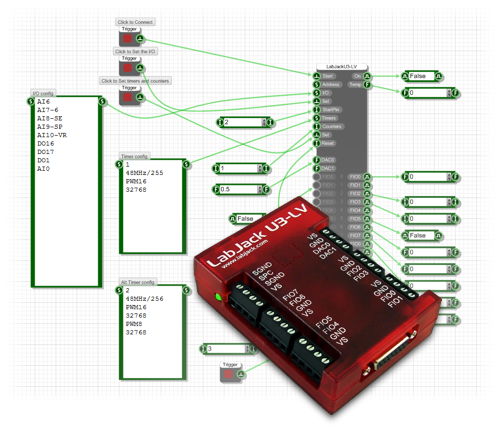 This basic example shows the use of a U3's timers, analog inputs, and digital I/O.